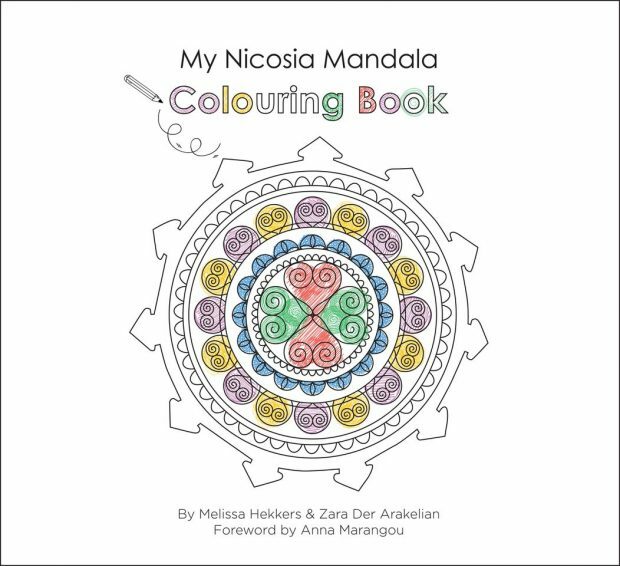 The colouring book ‘My Nicosia Mandala’ depicts a series of 11 ‘mandalas’ set within the framework of the walls of the old city of Nicosia, in black and white, for the entertainment of both children and adults. Considered as a practical example of an ‘ideal city’, the remaining venetian fortifications of Nicosia still pay tribute to a concept that was visually based on grids and other geometrical patterns that encouraged moral, spiritual and lawful qualities of citizenship. A mandala, meaning ‘circle’ in Sanskrit, has a concentric structure which offers balancing visual elements that symbolise unity and harmony; each mandala having its own, unique meaning. Encompassing the circular shape of the mandala within the outline of the ancient walls of Nicosia and its 11 bastions was a visually natural reaction. Seeking to create ‘Nicosian’ mandalas, Melissa Hekkers almost effortlessly began photographing elements on both sides of the divided city in order to create 11 mandalas, each representing one of the bastions of our capital. The metal work on windows and doors, the stone work of buildings and churches, the floor patterns within traditional houses, the metal street lights and the balconies within the walls of Nicosia are the inspiration behind the mandalas one will find within the pages of this book. The process of colouring, both for adults and children, has recently been deemed as a healing one; an act where one remains focused and in the process is soothed and nourished, an idea the author felt was suiting for a multiethnic city which, just like mandalas, requires unity and harmony in order to peacefully work as one entity. “Creating these mandalas, looking deeper into the details of Nicosia and embracing the city as a whole has been a journey I thoroughly enjoyed,” says author Melissa Hekkers.